Home › Home and Kitchen › Fish Spatula - Adeptchef Stainless Steel Slotted Turner - Beveled Design Idea.. Fish Spatula - Adeptchef Stainless Steel Slotted Turner - Beveled Design Idea.. ROBUST AND RESILIENT PREMIUM QUALITY Constructed with a sturdy, stainless steel core and spatula head, this fish spatula is designed with optimum quality for heavy and long durable grilling. Great for use with whole fish, filets, seafood cakes, and more! PRECISION-ENGINEERED DESIGN FOR EFFECTIVE PERFORMANCE 100% restaurant quality stainless steel and BPA free turner, comfortable ergonomic grips are splinter-free (unlike wooden handles), slotted turner allows grease to drain, and is beveled for easy sliding beneath foods every time! Edged-end for functional cutting during grilling, acts as a knife. MULTI FUNCTIONAL FLEXIBILITY Also works great with meat, eggs, baking and more! DISHWASHER SAFE Very easy to clean. You can either choose to clean by hand or you can use your dishwasher without any problem! QUALITY FOR 100% SATISFACTION Rest assured that AdeptChef offers complete customer satisfaction. If for any reason you are not absolutely satisfied with your product we will replace or refund your order, no questions asked. CONTACT US directly and we will take care of you. AdeptChef: Premium Quality Stainless Steel Fish Spatula for Durable Frying and Grilling Are you looking for optimum quality? - Are you sick of unreliable fish spatulas that are difficult to use? - Are you looking for a premium design? - Do you want a high-end quality fish spatula when it comes frying and grilling? Introducing AdeptChef Fish Spatula The AdeptChef Fish Spatula is the perfect tool for flipping everything fromwhole fish to filets, and more, with ease and perfection. With a comfortablegrip and thin flexible edges it will allow you to execute the perfect flipevery time. Why choose AdeptChef Fish Spatula? Here are the benefits: - Constructed with a sturdy, stainless steel core and spatula head, this fish spatula is designed with optimum quality for heavy and long durable grilling. Great for use with whole fish, filets, seafood cakes, and more! - 100% restaurant quality stainless steel turner, comfortable ergonomic grips are splinter-free (unlike wooden handles), slotted turner allows grease to drain, and is beveled for easy sliding beneath foods every time! Edged-ended for for functional cutting during grilling, acts as a knife. - Also works great with meat, eggs, baking and more! - Easy wash capability, which will allow the product to maintain premium quality! You will always be backed up by our satisfaction promise! 100% Customer Satisfaction Guarantee You know you will never need to worry about the lack of quality with thecomfort of AdeptChef's complete customer satisfaction guarantee. 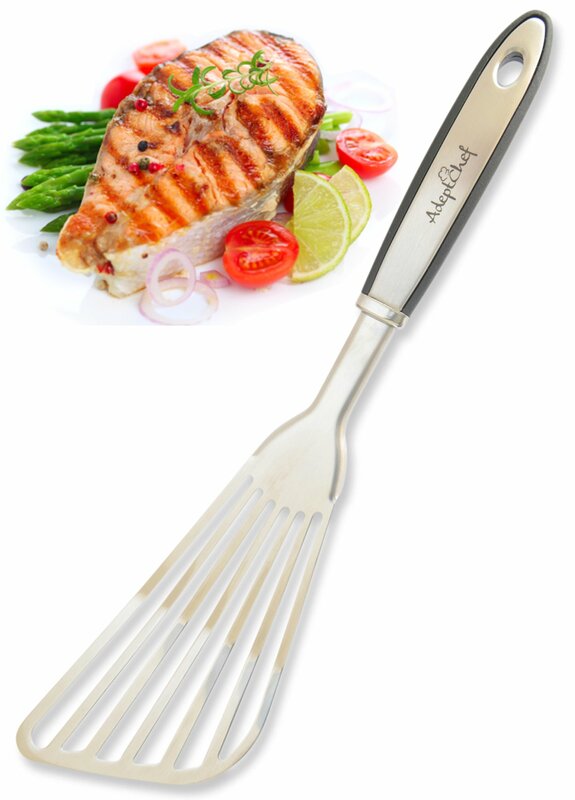 So click the 'Add to Cart' button NOW and experience the quality anddurability of an AdeptChef Fish Spatula right now!